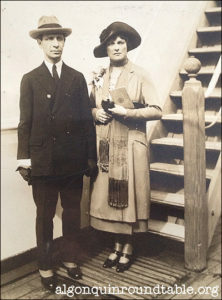 Franklin P. Adams and his second wife, Esther Root, on their honeymoon, 1925. Franklin P. Adams wrote his diary from 1911-1941; by his estimate more than two million words. It began June 11, 1911, in the New York Evening Mail. The column was called Always in Good Humor. On January 1, 1914, F.P.A. joined the New York Tribune staff and changed the name to The Conning Tower. He remained there until December 31, 1921, when he joined The World. When The World folded, he moved to the New York Herald Tribune on March 2, 1931. His column appeared there until 1937. His column ended in the New York Post in 1941, by which time F.P.A. was a radio star on Information Please. Editor’s note: These entries are taken directly from the collection The Diary of Our Own Samuel Pepys, published by Simon and Schuster in 1935. All of F.P.A.’s idiosyncratic spelling and grammar usage is left intact. Editorial notes in [brackets] are from the editor and in some cases F.P.A. himself. None of the entries have been altered. Adams was born in Chicago on November 15, 1881, and died on the Upper West Side of Manhattan on March 23, 1960. All day in the country, and had a pleasant day, playing croquet. Home, when I find E. Ferber [Edna Ferber] and Janet Grant and Miss Rosalind Fuller [an English actress and singer]; and A. Woollcott [Alexander Woollcott], very grand in a silk hat, and H. Ross [Harold Rosss]; and we had a frugal supper, and all left before eleven. Read [William] Congreve’s poems, indifferent stuff. Up and to the office early away and met Mistress Beatrice Gunsaulus Merriman [spouse of Rev. Robert Noel Merriman], who has come from Bethlehem to have a birthday party with me to-day and to-morrow. So we to Dottie Parker’s, where was a great crowd gathered to honour me, and a great shower of presents, tyes, and kerchiefs and a neck-scarf. So now home with Beatrice [Kaufman] and thence to a great and gay gathering at Mistress Ruth Fleischmann’s [Quincy, IL, native, spouse of baking heir Raoul], where I had the merriest birthday party anyone ever gave me, but they told me it was H. Miller’s [Henry Wise Miller, banker, spouse of Alice Duer Miller] and G. Kaufman’s [George S. Kaufman] and A. Krock’s [Arthur Krock, newspaperman, won Pulitzer 1935] and Beatrice’s, and that Ruth and Raoul had been married this day three years, yet by 10 o’clock I was certain the party was entirely in my honor and was not disinclined to think that the universe had been constructed for the same delightful purpose. So home, despite all in the car counseling to drive with more caution, and we had to walk up the stairs, and Beatrice lost an earring, which distressed her, but I told her we should find it in the morning. For a walk in the warm sunshine, and to luncheon at L. Dodd’s [Lee Wilson Dodd, playwright, novelist, poet, died 1933], and my wife told a tayle of some children who, being warned not to express astonishment when the ice cream was borne upon the table, did carol forth, “We have it all the time! We have it all the time!” So by steam-train to the city, and thence to the office, and so to R. Fleischmann’s, to a great party, and met Miss Fay Compton the play-actress, as fair and sweetly spoke a lady as ever I saw. This day my birthday, and my wife give me a fine golden knife and H. Miller give me some kerchiefs and A. Samuels [Arthur Samuels, composer, publicist, editor] some tyes, all of which I was very glad to get, not so much for the sentiment behind them as for the value and beauty of the gifts. This day Frank Sullivan back to work, and he come to see me, looking very handsome with his long rest. All day at my office, and so home and did some scrivening before dinner, and my wife telling me that I had misspelled our handmaiden’s name, calling her Dougherty instead of Doherty, so I asked her whether she were a relative of the great lawn tennis players, but she said she never had heard of them. But she is as skilful in her field as they were in theirs, and I would suggest that she would play in the final of any cooking tournament. So to the theatre in Florence Hammond’s [spouse of Herald-Tribune drama critic Percy Hammond] petrol-wagon, and saw Shaw’s “Pygmalion,” and enjoyed it all mightily, in especiall Miss Lynn Fontanne’s and Mr. Henry Travers’s acting. And I did make some vows, on this my birthday, such as to waste no more time in frivolity, and to be more kind to my fellows. Yet last night there was a discussion about murder, and some that they were incapable of killing anybody, and they thought I would be, too; but I thought there was none in that company that might not have murder in his heart at some time; and as for myself, I know many persons I would like to kill, if there were no penalty attached to the act. Lord! if I could murder those I pleased to kill, it would almost be impossible to get a taxicab in this city. So home, and read E. Pearson’s [Edmund Lester Pearson] “Murder at Smutty Nose,” a thrilling compilation, with things in it about the Parkman case, and Dr. Crippen [Hawley Harvey Crippen, the first criminal to be captured with the aid wireless], and others. Early up, it being my birthday, and my wife give me a crimson sweater to wear next summer, and I got letters from my sisters Amy and Evelyn, and so did my work in the morning, and in the afternoon to H. Miller’s to listen to how badly the Yales would beat the Princetons, but they scarcely beat them at all, and so we to Manhasset, to a giant birthday celebration given for me at R. Fleischmann’s, very merry and gay, and I had a pleasant time with Mrs. Delehanty [née Margaret E. Rowland, spouse of John Bradley Delehanty, noted architect], who tells me she is a girl from Phillips, Wis., and she very gifted, shewing me how she can stand on her head, and I had a talk with A. Barach [Dr. Alvan L. Barach, founder of pulmonary rehabilitation and inventor of the oxygen tent] the physician, of clairvoyancy and fortune-telling and palm-reading, we telling each other of the great success we had at these charlatanries, what with the subjects telling us all that we wanted to know, and then being astonished at our magickall powers. But it is a dangerous thing to do, forasmuch as I never shall forget the trouble that I got into by telling a girl that she did not have confidence enough in herself, which is a thing that everybody believes about himself, especially those that have more confidence than they should have. It is also safe to tell people that they are too generous and too tender-hearted. So late to bed, and waked my wife, albeit I was quiet as a million mice. Lay mighty late, and so up and wondering what would be happening on November 15, 1981, I then being 100 years of age, but I fear that this will be the last time that there will be a legal holiday on my birthday, and so read the newspapers with great misgivings about what is going on in Manchuria, and would forecast that a year from now matters will be more troubled and unpeaceful than they are now, and so talked with A. Krock and R. Fleischmann about history and its teachings, and Krock said that he was proficient in its study when he was a boy forasmuch as it was taught with a stress upon dates of wars and deaths of kings and history made so little impression upon me that I forget how it was taught. But I feel that it ought to be taught backwards; that is, that the study should begin with the front page of today’s newspaper and go on from there to last year, and that it might then seem important and personal to the student to read about the Spanish Armada and Eric the Red and the Battle of Stirling and Ticonderoga and General P. T. G. Beauregard and Bannockburn and Themistocles and Hadrian and Ypres and Rutherford B. Hayes and Aguinaldo and the Guelphs and the Franco-Prussian War. So in the afternoon my wife and I beat H. Miller and R. Fleischmann two deuce sets, and in the evening had a very merry birthday party, almost everybody having been born a few years ago today, yesterday, and tomorrow; and so A. Woollcott drove me to the city in a cab, and told me many fascinating things, he being no less laconic than ever, and about how Herbert Wells, the author, had come to see him, and of many other things.